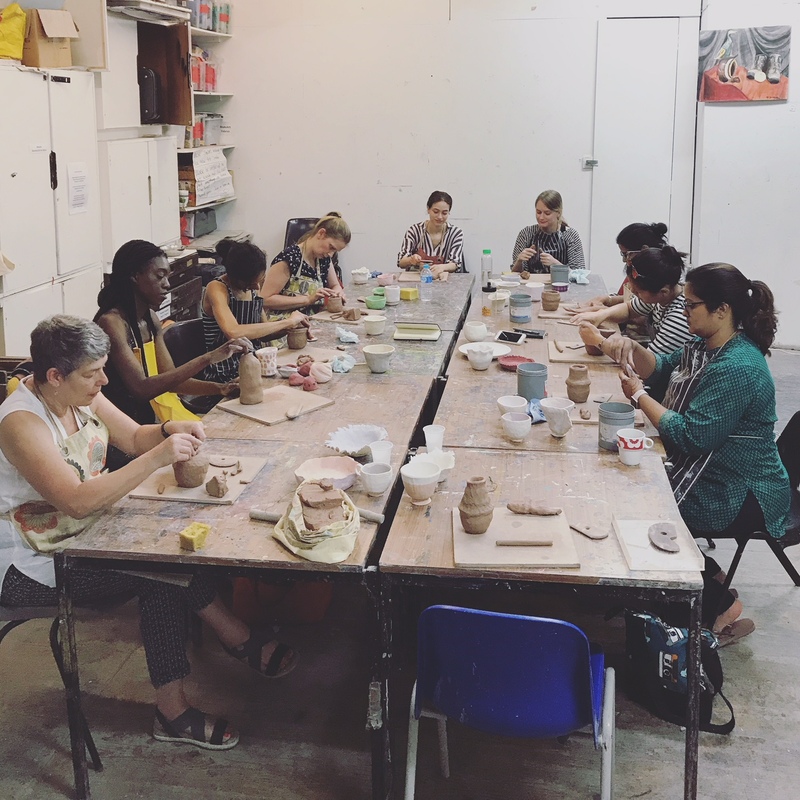 Beginners’ Course: Intro to Clay 2019 – Spaces Available! · £150 per person – all materials and firing included. These workshops are designed to give an in-depth taster of a range of basic hand building and decorating techniques. Create functional pieces from start to finish: make with a range of different clays, experiment with exciting textures and colourful surface decoration, and glaze some of the fired pieces. Please note, these workshops do not cover working on the pottery wheel. Attendees must commit to all sessions in the course. Refunds and exchanges will not be made for missed workshops. Notice of cancellation must be made at least 14 days prior to the course beginning in order to obtain a full refund. Refunds will not be given after this time. Maximum 10 people per course to allow for lots of individual attention. Email Kayley to book a space using the form on the contact page. Payment required upon booking by bank transfer to hold a space. Roll perfectly even slabs of clay and press them into a plaster mould to create a shallow dish or bowl. Explore the decorative possibilities of decorating slips (coloured liquid clays). Use newspaper, slip trailers, a range of brushes and wooden tools to create exciting surface decoration. Follow your instincts and experiment with the simplest way to manipulate clay – I said simplest, not easiest! Pinch the clay between finger and thumb and practise controlling the form to create functional objects. Play with tools to create surface texture and add handles, foot rings and lips to determine the function of your piece. Learn the steps involved in basic glaze-dipping and brushing, working with the fired results from Sessions 1 & 2. By the end of this session you’ll be an excellent coiler! Learn how to roll the perfect coil, build a pot from the bottom up, fix the coils together so they never come apart and experiment with form by placing the coils in different formations. Grate, scrape and refine your coiled piece from Session 3 to reduce the weight of the piece and create your desired surface finish. Roll beautiful slabs, add texture and learn how to stick them together to create vessels with curved and flat sides. Attendees of group workshops must pay a £1 Membership Fee to Islington Arts Factory on the door for each workshop they attend. Termly and Annual Membership options are also available.